Puerto Rico's government says 3,600 pounds (1,633 kilograms) worth of donated supplies are en route to Venezuela as part of a humanitarian aid mission. It is unclear where the plane and supplies are currently located. Rivera said: "(It's) an extremely complex route that is being protected to ensure the safety of those transporting the supplies as well as those receiving them." "We have decided to stop publishing online content until cybersecurity has been restored," read a message posted by the ministry on Twitter. The U.N. says Secretary-General Antonio Guterres believes "humanitarian aid should never be used as a political pawn." U.N. spokesman Stephane Dujarric told reporters Thursday that humanitarian assistance should be based on needs and "carried out in accordance with the principles of humanity, neutrality, impartiality and independence." He said humanitarian assistance always "needs to be independent of political, military and other objectives." Dujarric said in the current standoff in Venezuela, "it becomes even more clear that serious political negotiations between the parties are necessary for the sake of the people of Venezuela." He said "as a general principle, the secretary-general has been supportive of international efforts to try to bring a solution to the current crisis in Venezuela." Abrams tells reporters in Washington that the U.S. does not favor a specific country for Maduro to go to but notes that the embattled Venezuelan has "friends" in Cuba and Russia. The home page of the Venezuelan embassy in Washington appeared to be down amid increasing tensions between the United States and the South American nation. The site http://eeuu.embajada.gob.ve showed an error message on Thursday and was inaccessible to the public. President Nicolas Maduro has ordered all Venezuelan diplomats home from the United States and said it is closing its embassy. The Associated Press asked the Venezuelan mission to the Organization of American States about the malfunction without receiving an immediate response. The mission includes the only diplomatic staff currently present in the U.S. capital. Watchdog groups say the dominant internet provider in Venezuela, state-run CANTV, has blocked access to social media sites at least four times since opposition leader Juan Guaido pledged to serve as interim president of the country on Jan. 23. Trucks carrying U.S. humanitarian aid headed to crisis-wracked Venezuela have arrived at the Colombia border. On Thursday semi-trailers loaded with boxed emergency food and medicine rolled into the town of Cucuta, which is just across the river from Venezuela. Venezuela's opposition leaders requested the shipments and vowed to bring them inside the troubled nation despite objections from embattled President Nicolas Maduro. The focus of Venezuela's political fight now hinges on whether Maduro will allow the aid to pass. Opposition leader Juan Guaido said the aid is necessary in a country racked by shortages of basic goods. The Venezuelan military has barricaded a bridge between the two nations in an apparent attempt to block the aid. Puerto Rico's government says it has sent humanitarian aid to Venezuela for the first time via a plane loaded with 3,600 pounds (1,633 kilograms) worth of supplies that included medication, food and items for children. A spokeswoman for Puerto Rico's Secretary of State said Thursday that the humanitarian aid is not part of the $20 million in aid pledged by the United States. Ana Santos Pico told The Associated Press that she could not provide additional information such as what kind of plane was used for Wednesday's mission and who owns it. Santos said: "It's a complicated mission, and we cannot provide more details. We need to maintain strict confidentiality." 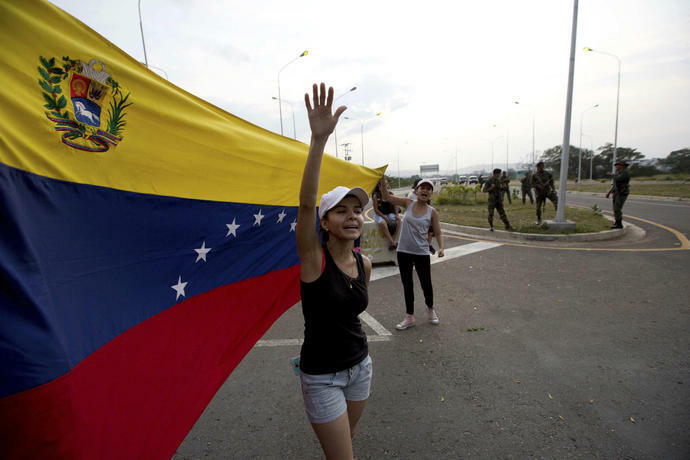 Venezuelan community leader Sonia Cosme told the AP that the medication sent to Venezuela is to help treat diabetes, blood pressure, asthma and seizures. The items for children include diapers, formula, milk, oral serums and protein drinks. The food items were mostly cereals. No further details were available, including where the plane landed. Cosme said: "Humanitarian aid has to be done with a very low profile. They persecute those who send it and those who receive it." Puerto Rico Gov. Ricardo Rossello announced on Jan. 31 that his administration would be collecting donations as part of an upcoming government-led humanitarian mission. A spokesman for the International Monetary Fund says the executive board of the body will delay a planned meeting to determine whether Venezuela has met its obligation to share periodic information. There was no original date set for the meeting. Opposition leader Juan Guaido pledged on Jan. 23 to serve as interim president of Venezuela and has been recognized by many countries in the Americas and Europe. The IMF has not recognized Guaido. IMF spokesperson Jerry Rice said Thursday: "Countries are still establishing position in terms of recognition. The process is ongoing." He would not say whether the IMF has had any contacts with Venezuelan authorities or the interim government. The IMF's No. 2 official David Lipton called Venezuela's economic crisis an "unprecedented economic storm" that will require generous international support. 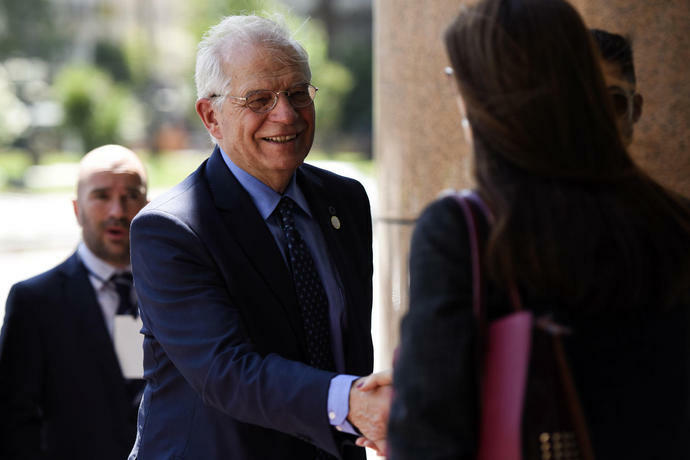 The Vatican says Pope Francis is willing to see if Venezuelan opposition leader Juan Guaido would agree to Vatican intervention to help relaunch talks with embattled President Nicholas Maduro to try to end the country's political standoff. Vatican spokesman Alessandro Gisotti issued a statement Thursday after Francis told reporters that he would consider Maduro's request for Vatican involvement but that the "preliminary condition" for any external mediation was that both sides requested it. Gisotti said: "The Holy Father has always reserved the possibility, and therefore still reserves the possibility, of verifying the will of both sides to see if the conditions exist to take this step." Guaido, who has declared himself interim president, has made clear that any offers of dialogue must start with negotiating the terms of Maduro's exit. A top European Union official is calling for free and transparent presidential elections in Venezuela to bring a peaceful solution to the country's crisis. 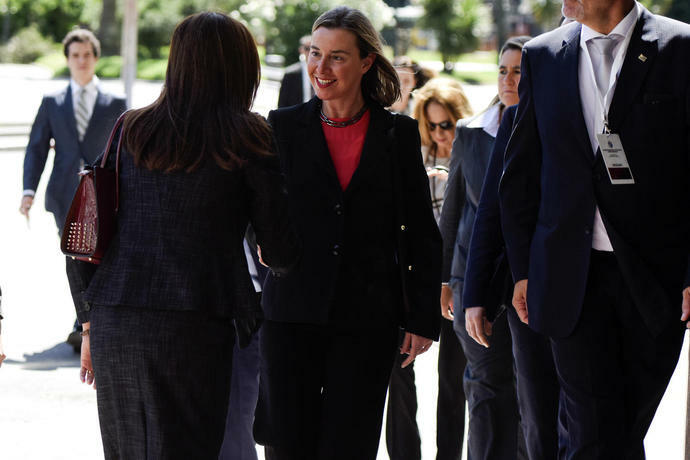 EU foreign policy chief Federica Mogherini spoke Thursday in Uruguay's capital at the inaugural meeting of an "International Contact Group." The group is meeting amid tensions after Venezuela opposition lawmaker Juan Guaido declared himself interim president and said he was seeking to oust President Nicolas Maduro following a 2018 election that many countries as a sham. Mogherini says the group holds different views on what led to Venezuela's crisis and doesn't seek to impose a solution. However, she says the countries share the same objective of seeing the country's crisis peacefully resolved without violence and a foreign intervention. A Venezuelan man whose wife has advanced breast cancer is urging President Nicolas Maduro to accept humanitarian aid. Luis Escobar made his plea at the border bridge connecting Colombia and Venezuela where aid is expected to arrive. Escobar says that he doesn't want other Venezuelans to suffer his wife's dire fate. Humanitarian aid from the United States has arrived in Colombia and is en route to the country's border with Venezuela. Maduro has refused to accept the aid, and the military has blocked the bridge where the supplies are expected to arrive.